This project needs a better name! So, I mentioned in my post about the Asterisk Hat that I was plotting a new sweater for me: a grown-up version of the Red Striped Pocket Pullover that I made for M. I…am really quite bad at naming things (my daughter excepted…she has the best name!) and I’m struggling with what to call this. I keep just writing out really boring, lengthy descriptions: “Top-Down Striped Contrast-Sleeve Pocket Pullover” is just not a name for a pattern! And I mean…I’ve already got a pattern named “Stripes!” and I keep calling the baby version of that one “babyStripes!” and I called M’s kid version “kidStripes”, and her sweater with octopuses around the yoke is just called “Octopus Yoke”, and I’ve just been calling my shawl-collared cardigan in garter rib the “Garter Rib Cardigan”, and the Bohus-style yoked sweaters I’ve made for M and I just get called “Bohus Yoke” and “mini Bohus Yoke” and y’all, I clearly need an intervention if I’m ever going publish any of these designs! 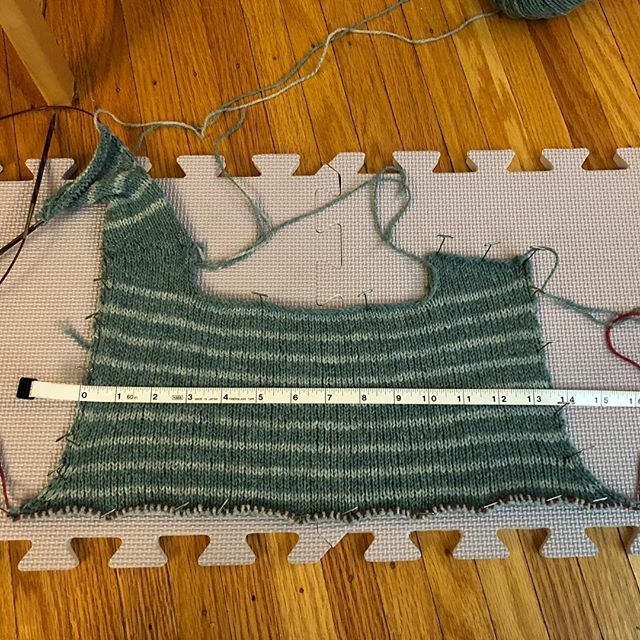 But anyway, with thanks to my husband for helping me measure myself, and thanks to Elizabeth Doherty for her “Top-Down” book, and thanks to my own brain for being able to do math…I’ve made some good progress on my pullover. 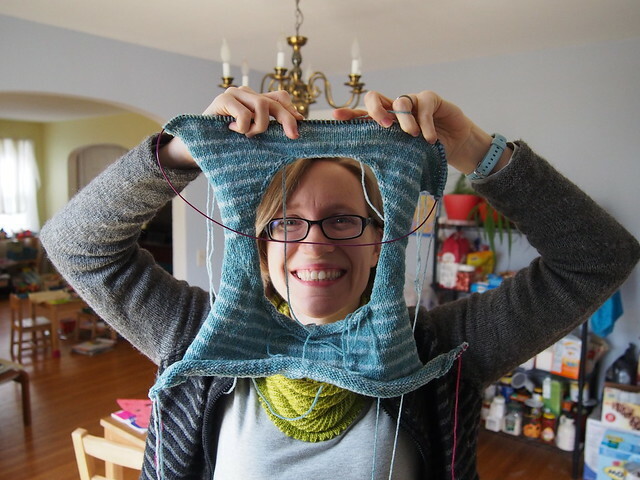 The nice thing about knitting top-down is that it’s easy to take measurements as you go, and once you join the front and back, you can even try it on as you go. I did a little “sanity check” and pinned out the back piece after I’d started the front, because the way the knit fabric was curling out was making it look comically small for me, but the cross-back measurement is exactly what I wanted it to be, and the armhole depth is just right, too! I’m so delighted with how the stripey fabric is turning out. The two colors of De Rerum Natura Ulysse that I’m using (Ciel and Lagon) look VERY similar on the skein, but work into a nice subtle stripe in the fabric. And the yarn itself is just an utter delight to knit with – so bouncy and wooly, and so soft in a rustic sort of way! I’m getting close to finishing the front, at which point I’ll join the front and back and start knitting in the round. I’m aiming for a slight A-line fit, with a split garter hem that’s slightly longer in the back, and of course there will be pockets, just like on M’s version. 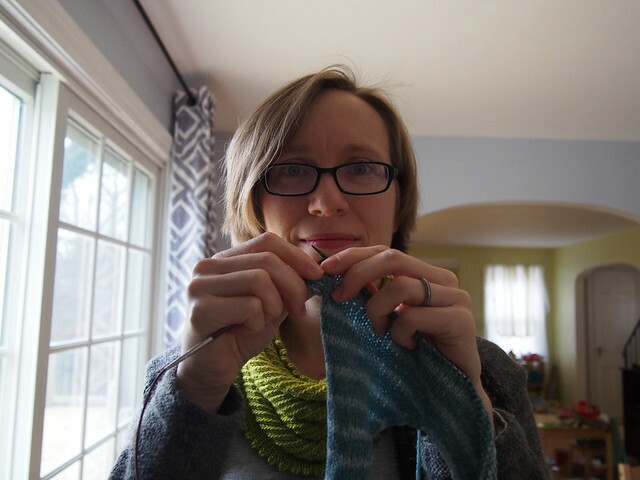 My time for knitting (and blogging about it) is about to take another nose-dive as we head into Spring Semester. But I’m hopeful that I can keep knitting down my stash, and finish some great sweaters and accessories for me and M (don’t worry about my husband – he knows I’ll knit him anything he asks for, but he runs MUCH warmer than I do, and doesn’t tend to want anything woolen! ).